Archaeologists have stumbled upon nearly 2,000 inscriptions left by soldiers fighting in France during the Great War. The exquisitely preserved markings were found in a tunnel that once provided shelter for villagers during the Middle Ages. The site, known as the Naours Caves, was once an underground city containing three kilometers worth of tunnels and hundreds of chambers dug out over the course of centuries. During the Middle Ages, villagers would live and hide in the tunnels as invading armies marauded the surface. By the 18th century, the entrance was blocked off and forgotten until a local priest rediscovered the site in 1887 and opened it up as a tourist attraction. 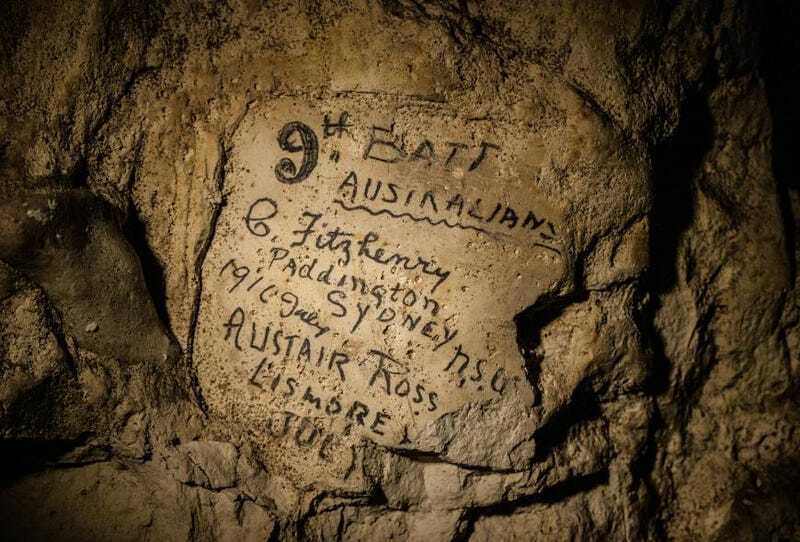 Now, thanks to the work of Gilles Prilaux, an archaeologist at France’s National Archaeology Institute, we now know that soldiers of the Great War sought out the caves, leaving their names and other inscriptions behind. As the AP reports, "he began a three-year study of the tunnels last July, intending to focus on the site’s medieval past — only to stumble upon this more recent slice of history." With the help of photographer Jeff Gusky, Prilaux was able to document 1,821 individual names, including 731 Australians, 339 British, 55 Americans, and a number of French and Canadians. Hundreds are still yet to be identified. The site, located near the Somme and at a staging area for the soldiers, shows how they bided their time as they prepared for the front — and how the soldiers were able to leave traces of their existence in the face of possible death.